Theatre of the Oppressed or Forum Theatre is a participatory process which offers people the possibility of identifying issues, articulating them in the form of short plays and creating a structure in which an active dialogue between the actors and the spectators is instigated in order to try and change the story. It is an interactive mode of behaviour which stimulates evaluation, critical thinking and imaginative responses. The contributions to this initiative will help equip a group of social activists with theatre facilitation skills. These activists are currently working on a range on issues such as: Land Rights, Electoral Politics, Religious and Caste based co-existence, Right to Housing, Right to Education, Labour Rights, Rehabilitation of manual scavengers, and so on. This workshop will help them stimulate their intellect and use theatre in their work practice, which will enhance their outreach and efficiency multi-fold. I first got introduced to Theatre of the Oppressed (TO) a few years ago. Engaging with TO exercises and putting together a Forum Play gave me the opportunity to engage with myself in a non-judgemental manner. It stimulated my intellect to be a better person and contribute more efficiently to the world, and in my role as a social worker. Over the years, I have facilitated various workshops with TO elements in it and at the end of each initiative, I wonder about the fiery potential this practice would have for young social activists across the country, who are working bravely, and relentlessly on addressing various social issues. 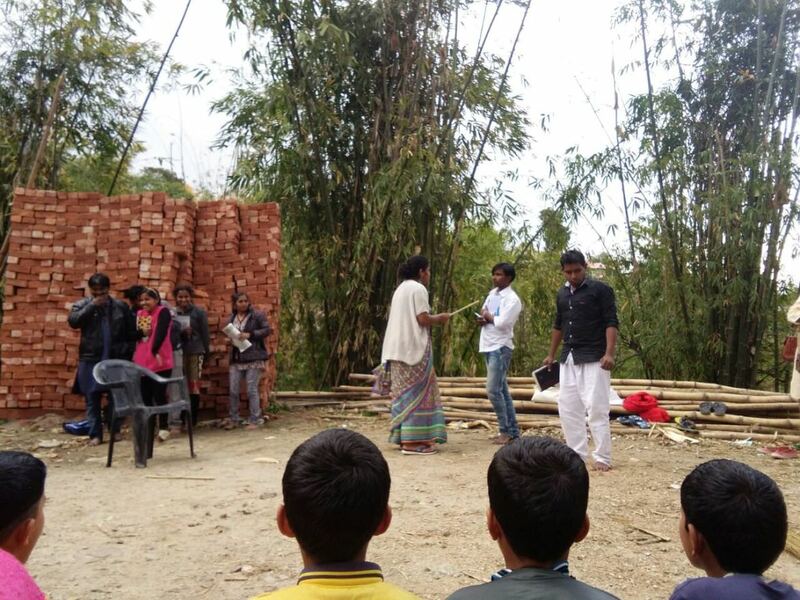 Equipping them with skills of theatre will be a powerful tool to use as they strive hard to pave a path of better living for the communities they are engaged with: a better world for all of us to be a part of. The Theatre of the Oppressed practice believes that every human being is capable of thinking. It is a form of theatre that deeply respects intellectual faculty of people and therefore has the potential to portray oppression and change the story. This form of theatre focuses not just on acting, but also action. It deliberates on the reflection of reality and a rehearsal for future action. 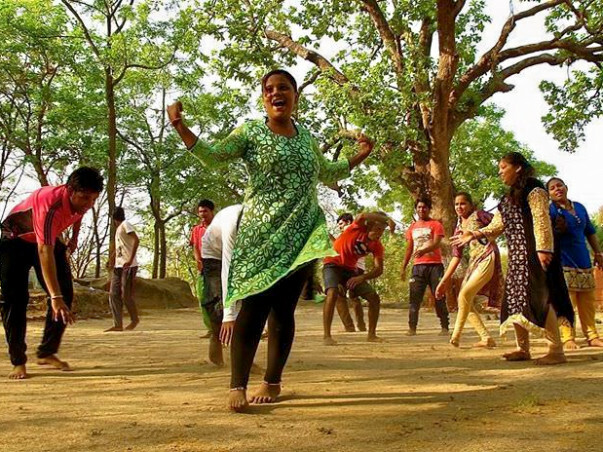 Janasanskriti Center for the Theatre of Oppressed is one of the pioneers in this field in India. Over the past 3 decades, Janasanskriti has addressed issues like domestic violence, girl child trafficking, child abuse, maternal & child health, primary education and health care, etc, all through theatre. Equipping social activists with skills of TO will enhance their ability to examine their own actions in relation with the community that they work with, the structural oppression in which communities are entrenched in and facilitate a creative process of birthing new ideas and actions for change. For the purpose of this workshop, we need a total amount of Rs. 2 lakhs. This workshop will be hosted at Sambhaavnaa Institute of Public Policy, Palampur. Nestled at the foothills of Dhauladhar mountains, Sambhaavnaa provides for an enriching learning space, allowing for nature to be a teacher as well. For the purpose of this workshop, Sambhaavnaa Institute has agreed to subsidize the boarding and lodging costs for the participants of the workshop. Part of the funds raised through this campaign will go to towards the basic costs of hiring the space for the workshop. Sanjoy Ganguly and Sima Ganguly from Janasanskriti have agreed to facilitate this workshop pro bono. Part of the funds raised through this campaign will go into reimbursing their travel expenses. Close to 30 social activists from across the country will be joining in as participants for the workshop. A majority of the funds generated through this campaign will be spent on supporting their travel costs. Your contribution is important! And no amount of contribution is less for us. Do support this initiative generously and share it with your friends too. We are so happy to share with you that the Theatre for Democracy workshop turned out to be fantastic! This could seem like we are beating our own drums, but having witnessed the intensity, integrity and solidarity in this one, one can barely resist the drum rolls. 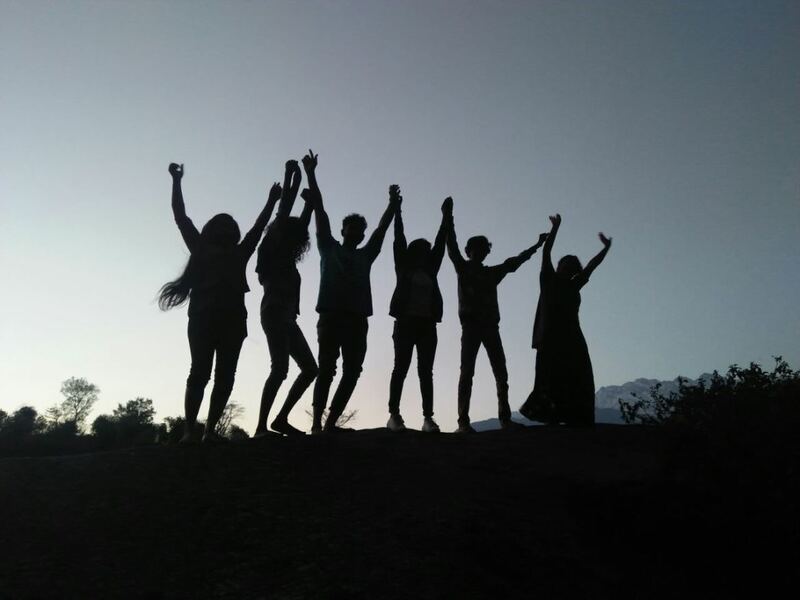 Over the past 4 months, as some of you might know, a small group of us got together to bring to reality our dreams of reaching out with skills of this very powerful form of theatre called Theatre of the Oppressed to the most brave and persistent social activists, who are involved in various trade unions and people’s movements across India. These folks are out there, on the front-line, resisting structural oppression and striving so hard to make this world a better place for all of us. Over the past few months, a couple of us were working on raising funds for this event, a few of us were involved in reaching out to these activists and inviting them for the event, a few more of us were involved in ensuring logistics of the event. By the first week of March, we were able to finalize around 25 participants for this workshop and were eagerly and nervously looking forward to it. Sima Ganguly and Satya Ranjan Pal from Jana Sanskriti were primary facilitators for this workshop. Their experience of having worked with Theatre of the Oppressed for over 30 years showed in the vibrancy, as well as detail in the processes. During the first day and a half, the workshop focussed on ice-breaking games and warm up exercises, essentially encouraging all participants to get comfortable with themselves and work towards creating a safe space for expression and exploration amongst all. On the second day, we started exploring Forum Theatre by engaging with an exercise called Columbian Hypnosis. Consequently, the exercises and processes were geared towards expressing and sharing personal stories from which one was affected, identified a conflict and wanted to change somehow. By the end of day 4, there were 3 stories that were selected by the group to work on in more depth and understanding. The first story was that of a young Dalit boy, who all his life has been a victim of untouchability and discrimination. In school, he is not only made to sit separately, but is also given the task of cleaning the class-rooms and toilets. He is teased and berated by his classmates for having dreams and aspirations of studying hard and becoming an officer. With the unrelenting support of his parents, the young boy works hard and gets an education. As he grows up and returns to his village, he witnesses that his other Dalit classmate is working as a servant for one of the rich upper-caste families in town. He gets thrown out of a barber shop while trying to get a haircut, for he is an ‘untouchable’. Finally he decides to complain against this incident and is humilated by the Sarpanch of the village in the process. The second play was about Sexual Violence within the marriage. The story was about a young girl who dreamt about getting married to the man of her dreams and living a life happily ever after. Soon ater, she gets married to a person who not only ensures that she quits her job to better serve him and his parents, but pressurizes her to give in to his sexual desires, irrespective of her consent. They have a child together and there-after too, the harrassment continues. She tries to talk to her friend about these problems, and all she gets in return is advice on how she needs to stop crying, the need to ‘adjust’ and snide remarks and cheap humour from the males who overhear this conversation. The child grows up to become a lovely young girl, very much in love with her mother and weary of her father. One night, as the young girl and her mother are sleeping, the father assaults the wife during which the girl decides to take a knife and threaten her father to either end her own life or his if his behaviour was to continue. The third play was on the topic of Child Sexual Abuse. This is a story of a single mother and her 8 year old daughter. The young girl is molested by an upper caste, influential man in a village. Despite confrontation and threats, he is uninhibited, and confident of his actions. The apathy of the police, the fear of the community to get involved in ‘such matters’ and the agony that the mother goes through as her child suffers is what the play tried to portray. The focus of Forum Theatre is to build plays in which the problem is highlighted, in terms of throwing light on various facets, gradients and layers of oppression. The plays are then presented to an audience who are invited to analyze the problem in the play, identify the oppressive and oppressed characters and somehow change the story. Forum theatre encourages a process of engaging with the Spectators and encouraging them to become Spect-actors to take action. For how long do we continue to witness injustice around us, and not take action? 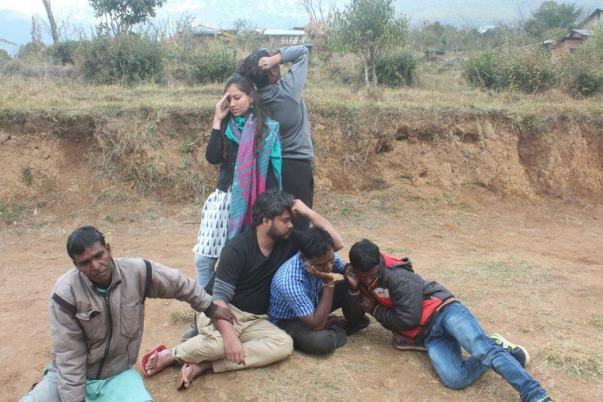 Of the three, the group chose to present the play about the young Dalit boy in a village in the neighbourhood, called Nain. This was a conscious decision taken, for there existing a functional caste system in this village, where inter-dining and inter-caste marriage are taboo. On the 6th day of the workshop, with much dhol and dhamaka, the villagers of Nain were invited to watch our play. Our presentation was in the middle of the village and started with a folk-dance performance (kolata) by saatis from Dilli Sramik Sangh. The khat-khat awaaz of the bamboo sticks attracted many more villagers to join us for the performance. 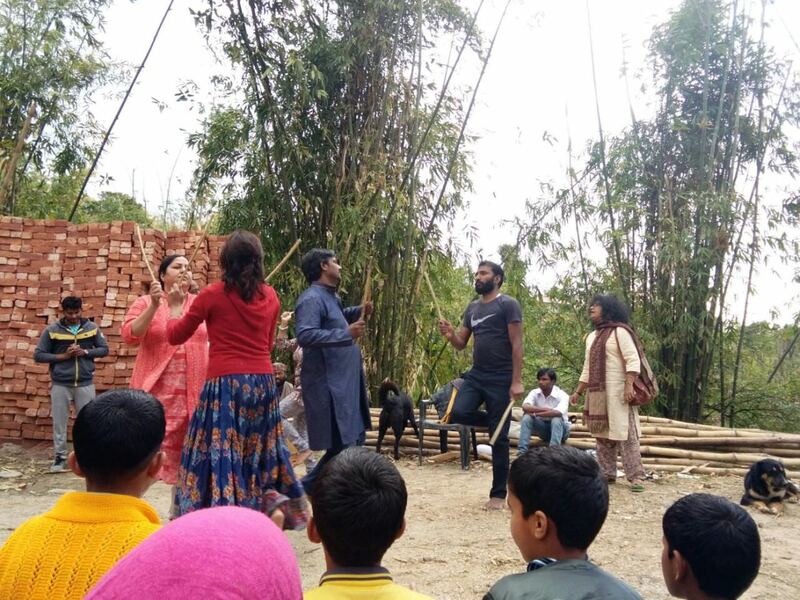 Two other plays too were performed within the Sambhaavanaa Institute, for the staff and some neighbours and encouraged a range of spectactivism too! On the 16th of March, which co-incidently was Augusto Boal’s birthday, we all met together to discuss the Federation of Theatre of Oppressed in India. Sanjoy Ganguly from Jana Sanskriti too joined us on a skype call to share with us the journey of the Federation so far and ways ahead. The need for the federation seems essential to build solidarity and support each other in the journey of working with TO, which sometimes could become very solitary and dark too. 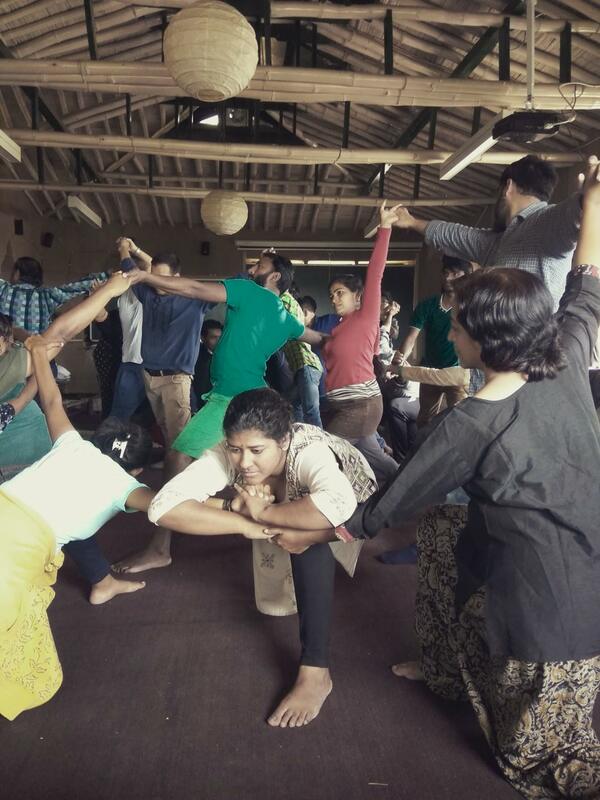 It was articulated that some young practioners of Theatre of the Oppressed might need more hands-on and on-ground support from older trainers. There could be a need for further centralized trainings too, to build on the expertise of trainers on certain aspects. 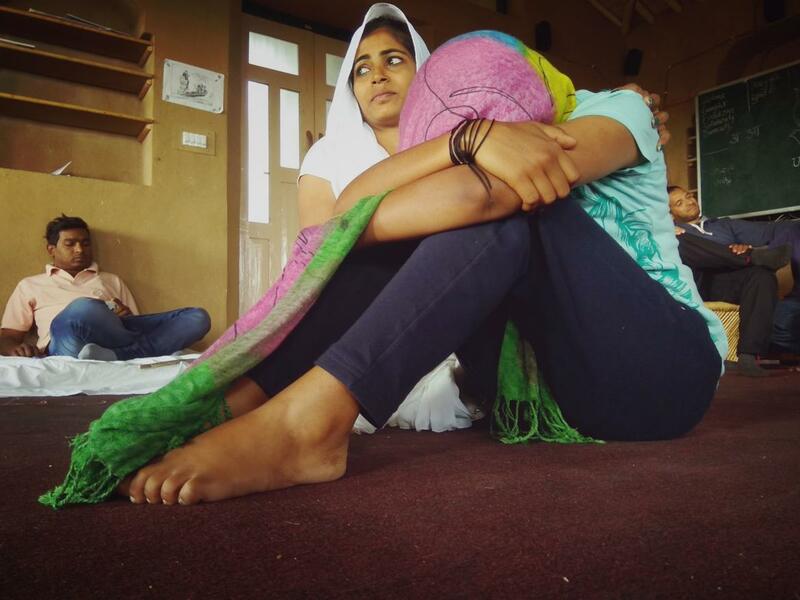 There could sometimes be a need to collectively take a stand and action on certain issues and the Federation of Theatre of the Oppressed, India (FOTO, India) will stand to co-ordinate and pitch into these needs accordingly. The workshop ended on a high note, with positive energies and high motivation. We hope to keep these energies high and work towards creating more spaces for dialogue and change. It would not have been possible to organize this workshop without your support. At the end of the day, each penny mattered. Here is a detailed break up of the income and expenses of the workshop. Please do not hesitate to ask us for more details on this, for financial transparency is an important value for us. In the meeting amongst the participants, it was decided that the remaining Rs. 38,462 will be used for FOTO activities, in time to come. We hold in gratitude the immense support that this campaign has received so far. 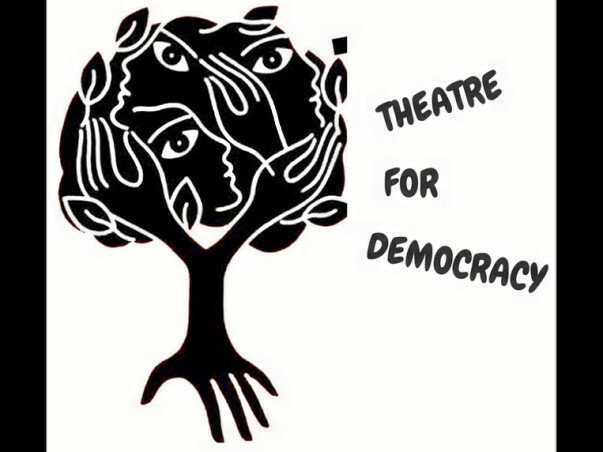 Heartfelt thanks to you for helping us get closer to the dream of organizing the Theatre for Democracy workshop for social activists. We are happy to share with you that the dates for this workshop has been finalized and will be conducted between the 11th to 17th of March, 2017 at the Sambhaavnaa Institute of Public Policy. I would like to take this opportunity to share with you a little story about the birth of Theatre of the Oppressed: Augusto Boal, the founder of the Theatre of Oppressed, used to perform with his group of actors a kind of street theatre in various villages across Latin America. In one such play, it was shown that the oppressed class of people united together to take part in a revolution. There was much action on the stage and the play ended with the slogan, ‘Come Now! Let us spill our blood for the sake of this revolution’. The audiences were awestruck by the energy of the play and there was a thunder of applause! It was indeed, a brilliant performance. During that time, Virgilio, an aged leader of the village stood up, congratulated the performers and invited the actors for a meal. He said, ‘Come, let us have lunch together and then we could talk more about this revolution’. Augusto and his group of actors enjoyed a delicious meal with everyone. After the meal, Virgilio met Augusto and congratulated him on the performance again. And then he told him that all the villagers were so very impressed with their play, that they were willing to be led by him and participate in any revolution to demand their rights. Augusto was taken aback by such an invitation and he said, ‘Yes, but that was just a play. This is your community and you have a take a lead in doing what is good for the community’. To which Virgilio responded by saying, ‘Oh! So when you chanted the slogan Let Us Spill our Blood, you actually meant our blood’. Augusto was startled by the old man’s response. It is when he realized the power of instruction that the actors had, and the significance of the fourth wall in a theatre performance in insulating the performers from any real social change processes. This realization disturbed him and it was this meeting between Virgilio and Augusto that gave birth to the Theatre of The Oppressed (TO). In years that followed, Augusto designed a series of theatre exercises that engaged the performers as well as the audience in an intellectual process that challenged both external (social) and internal (in the mind) structures, activating one’s ability to ‘act’ while witnessing a situation of injustice. Forum Theatre is one of the branches of the Theatre of the Oppressed, where the group of actors are guided to direct and perform a play to an audience with a focus of engaging the audience in the play. 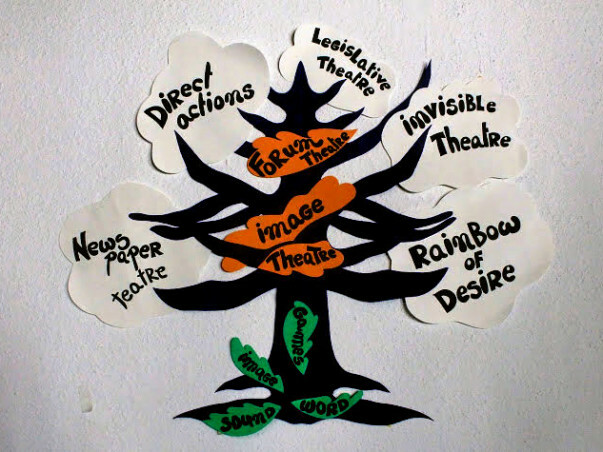 During the Theatre for Democracy workshop, we will be focusing on this branch of the Theatre of Oppressed. We will be engaging with the participants to equip them with theatre skills which will strengthen their links with communities in a way to enhance their participation in social change processes. We look forward to gaining more support on this campaign and to share more updates with you on our progress in time to come..